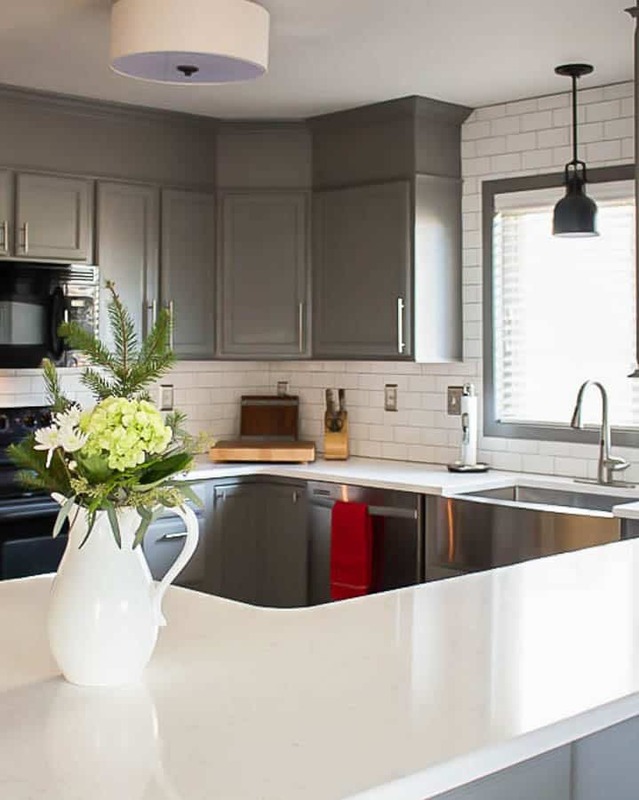 A builder grade kitchen gets a new look with classic features like gray cabinets, Quartz counters and subway tile. 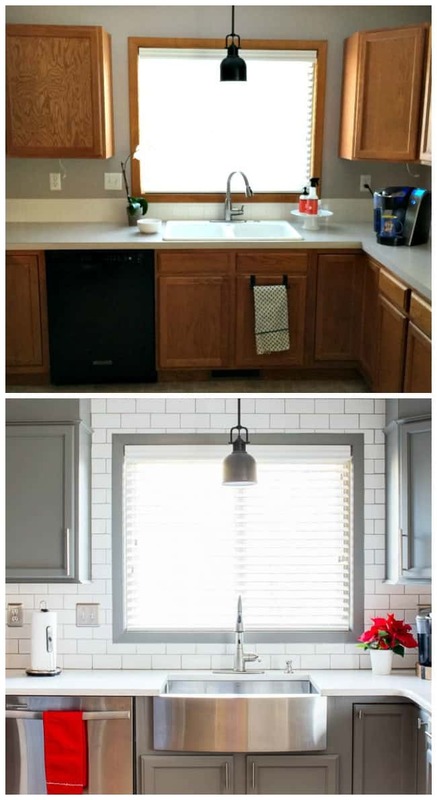 A truly inspiring kitchen before and after reveal. You guys, I am so excited to talk with you today! I’ve been waiting forever to finally show you the finished kitchen. You know, that makeover I started back in June. After seven months of tearing out, installing, painting and waiting the space is finally done. Well, a couple more little tweaks like under cabinet lighting and a couple appliance changes…but for now, I’m calling it. My favorite spot in this house is now my kitchen. I could sleep in here. This was the biggest remodel I’ve ever experienced. We kept the original cabinets and left the layout the same, but everything else changed! I learned a ton throughout the process, mostly how to be patient. 😉 The remodel started with the laminate counter tops and tile backsplash being removed to allow for the new Moen sink and faucet to be installed. I debated on getting one with a divider but I’m so glad I didn’t. I can fit almost anything in this sink making that not-so-fun task of doing dishes a little easier. The bottom grid is also great for protecting the sink from scratches and gives me a nice place to set hot pots to cool. The motion sensor faucet comes in handy every single day. When I’m trying to cook with a toddler on the hip, I need all the help I can get. 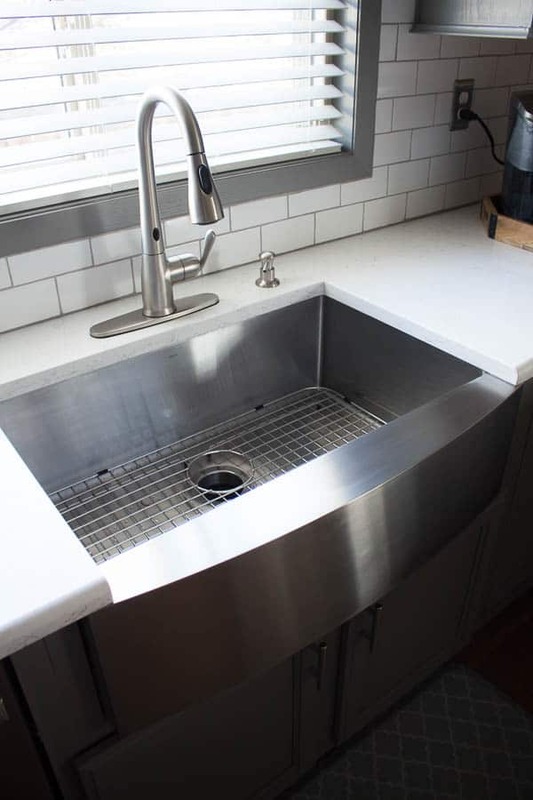 Once the new sink was in, the new Quartz counter tops from Wilsonart were installed. I went with the Haida design. 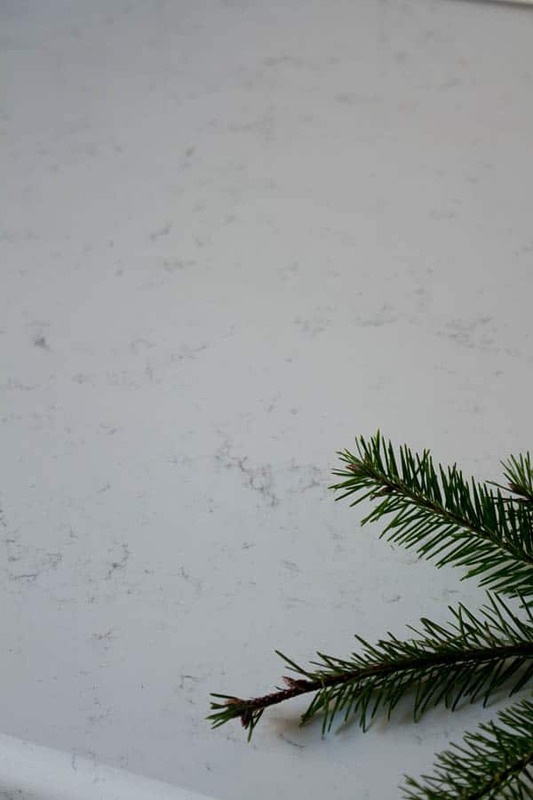 It’s a bright white design with fine, short black veining that looks very similar to the carrara marble look. We waited over a month for these beauties. A month of cardboard counters and lots of frozen pizzas. But friends, it was soooooo worth the wait! They turned out gorgeous and instantly brightened the whole kitchen. Both my husband I feel the counters made this kitchen what it is now…beautiful. One of my sisters favorite features of my kitchen make over is those stainless steel outlet covers. Once I finished installing the tile, the old covers just didn’t look right. 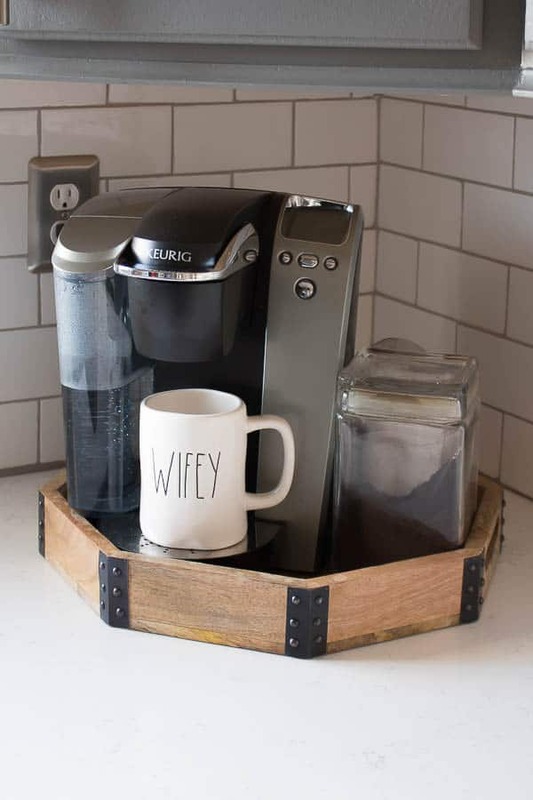 I love the look of these and it was such an easy, inexpensive update to do. Why not?! Now that the new floors were in, I was left with painting the cabinets. I knew I wanted to paint them gray, but there are so many gray choices! Wow. I finally decided on Benjamin Moore Chelsea Gray because it was a pretty neutral gray with a hint of some brown undertones. Since the living room has vaulted ceilings with walls painted in a soft brown (that I will not be painting any time soon), I wanted the kitchen to compliment. I’m not gonna lie, that first swipe of the paint brush had me a little scared. But once I got most of it painted…I was in love. I used a Wagner spray painter for the doors and hand painted the frames. UPDATE! 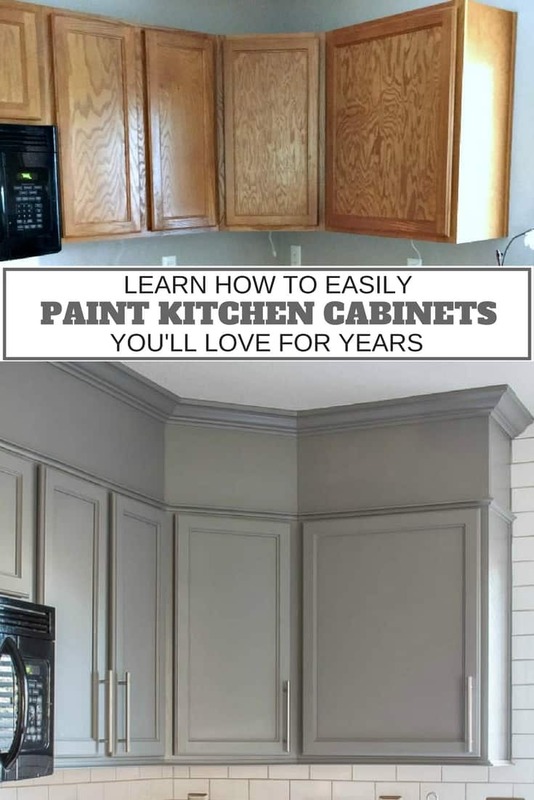 The tutorial on how to paint your kitchen cabinets is available (click here!). 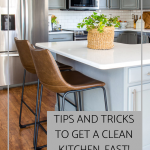 I included everything you need to know to do the job right! 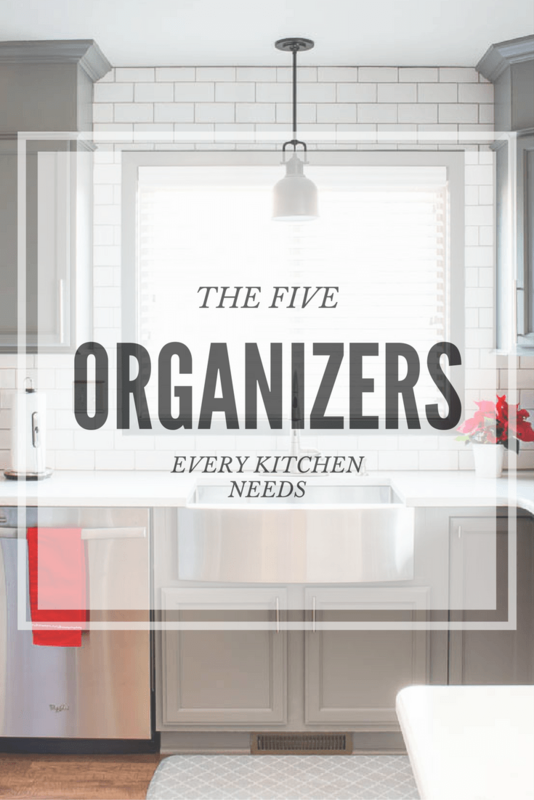 And if you are looking for ways to organize your kitchen, be sure to check out this post on the Five Organizers Every Kitchen Needs! Oh it looks amazing. I love the color and your choice of counter and sink are perfect. What a transformation!!! It turned out gorgeous… definitely worth all your hard work! What a fabulous difference! Gorgeous!!! Incredible!!!! Job well done. You certainly have a talent, Laura and are an inspiration. I really like the color combination and the gorgeous floor. Great style. WOW! Your kitchen looks gorgeous. BEYOND GORGE!!!! I’ve been waiting to see how this turned out and… WOW. 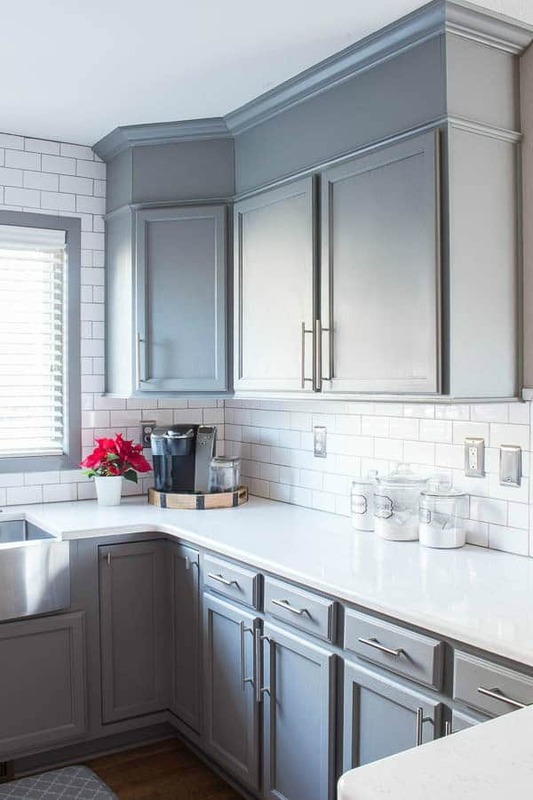 Love the grey cabinets + the dramatic crown molding look. Awesome, lady! This post is so inspiring! You did an AMAZING job!!!! So jealous! 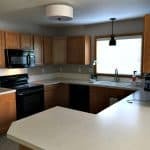 I’d love to update our kitchen but can’t afford to. It’s gorgeous! Oh Girl!!! That transformation is amazing! And gives me hope that one day I can complete our kitchen and have it look this good! Its Fab! Thank you, Jen! Trust me, if I can do it….anyone can! You go, girl! From top to bottom, it all looks so beautiful! Great job! 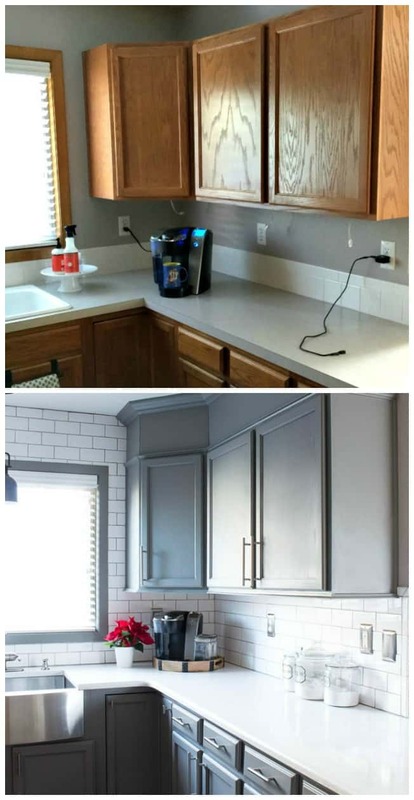 Love the grey cabinets! Everything turned out amazing. Love the transformation! This reminds me how much I want to redo our kitchen! It looks amazing, you did a stunning job. Your kitchen is beautiful! I love the color of the cabinets and the way you extended them to the ceiling. Thanks for sharing at the Family Joy Blog Link Party this week! WOW!!!! The Kitchen looks amazing! 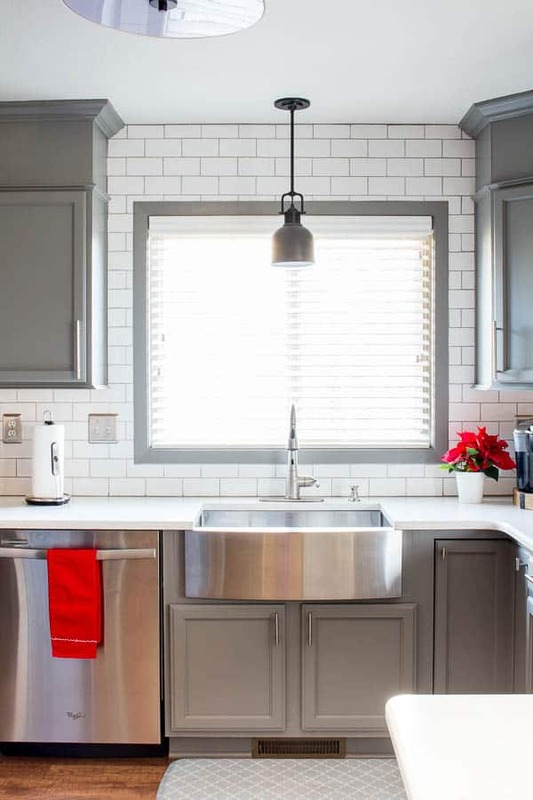 I’m obsessed with that sink – I would love to have a sink like that for our home! Congrats on finishing the reno and being able to enjoy your new kitchen. 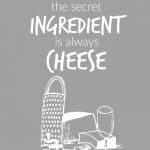 Thanks for sharing with us on the Family Joy Blog Link Party! Wow! It looks so great! I would never have imagined those were your original cabinets! It’s amazing what paint can do though I understand about picking the right color! We are in the midst of adding on a new kitchen. I also wanted the same kind of quartz so bad but our installer wasn’t able to get them in time. 🙁 I was so bummed but we did wood and they turned out nice. I also got a moen faucet and whirlpool fridge. We are going to do subway tile too and my husband is going to install it. Love all the inspiration and how it turned out for you! Wow! That’s definitely a big reveal. I love the colors. Thanks for sharing at Funtastic Friday. 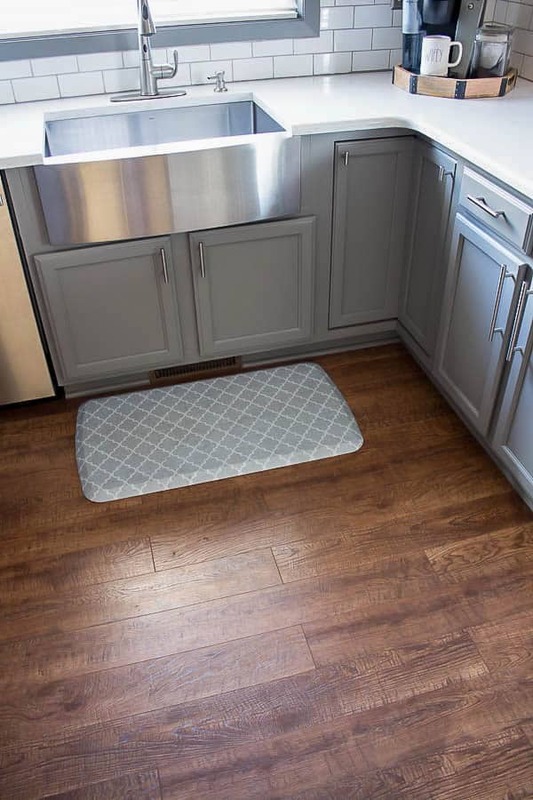 How did you get the sink cabinet doors to work with the longer sink? They look smaller than they were in the before pictures? Oh my gosh, Laura! Your kitchen is amazing! I absolutely love every single thing! It’s so bright and cheery! 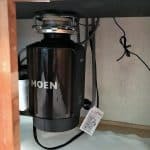 I’m dying over that Moen sink! 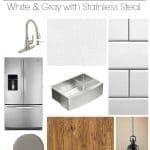 I had my heart set on a white porcelain farmhouse sink, but this is making me reconsider stainless! It looks amazing! Great work. Love this kitchen! You are extremely talented. 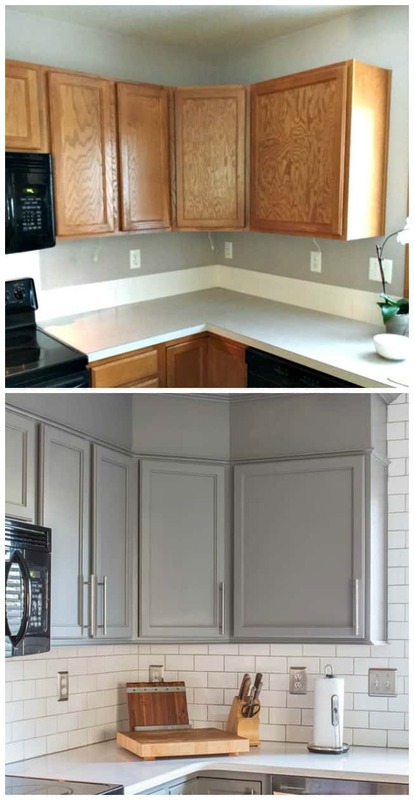 What material did you use to box in between cabinets and trim? Thank you. Thank you, Candice! I used mdf boards and I will be writing a complete tutorial on that transformation soon. It’s really a pretty simple job to do, especially if you don’t have 45 degrees angles like I did. 😉 Stay tuned! 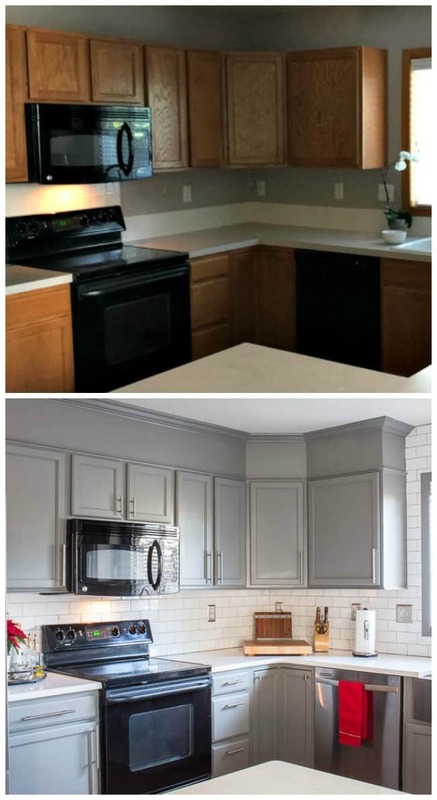 love what you’ve done from paint color, backsplash, and countertops! this is a look i would like to adopt in my kitchen. was interested to see that you noted your adjoining room was soft brown….same here. now i know what the effect would be in my own home. thanks for sharing! Your kitchen is just beautiful. I love it. What color paint and brand did you use for the cabients? Thanks, Mary! 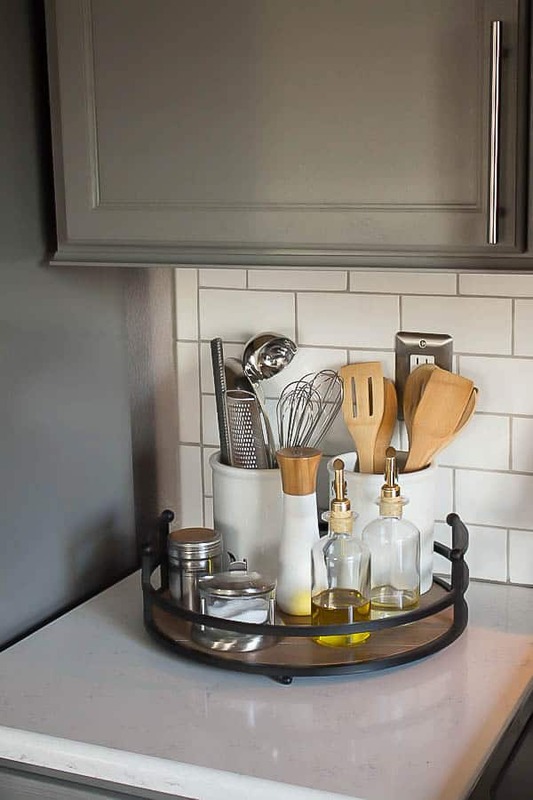 For my cabinets I chose Benjamin Moore Advanced Interior paint in Satin (in the color: Chelsea Gray). I was wondering if you have a tutorial of how you made the addition to the upper part of your cabinets? 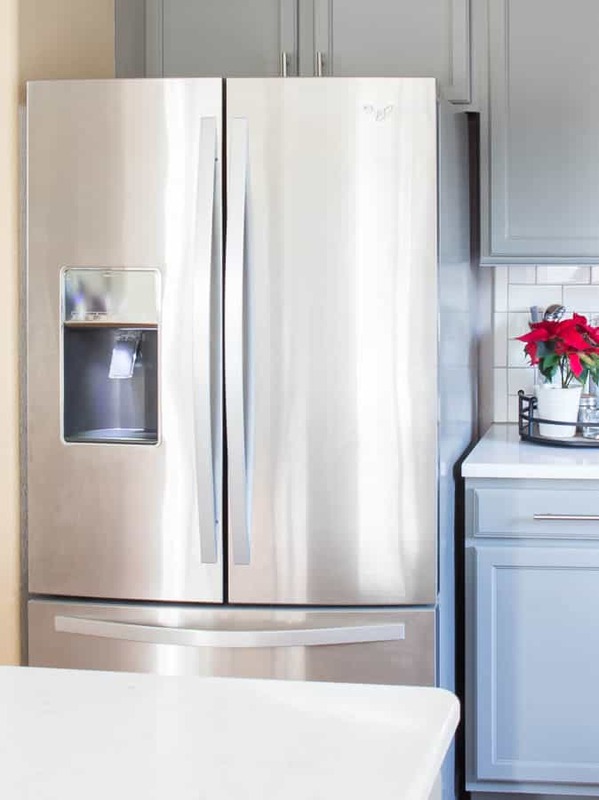 I am interested in doing that in my kitchen as my kitchen has 45 year old cabinets and I think what you did is absolutely amazing and gorgeous. LOVE your kitchen remodel. Been working on our kitchen remodel for a while now. We live remotely so finding paint colors, etc is quite a chore. What color white did you use to compliment the Chelsea Gray? 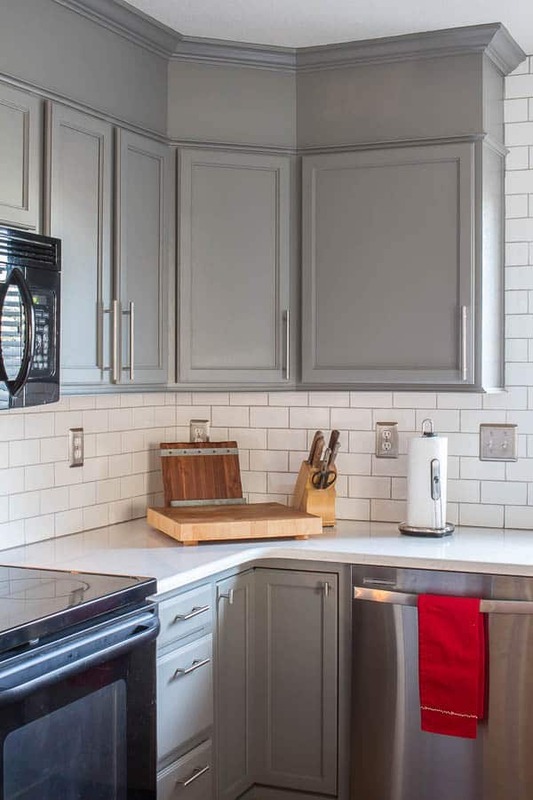 Is the kitchen window trimmed in stainless or is that the same paint color as the cabinets? So beautiful!! I have the exact same cabinets with the same space above but my ceilings are slanted for a vault ceiling. Do you think I could still do the top addition like you did? Thank you for sharing! Beautiful kitchen! Wondering where you found the light above your sink? Love it! Thank you so much, Celena! I actually got the pendant here: (aff link) https://inspirationformoms.porch.com/pendant Hope that helps! Your kithen is absolutley beautiful. We are in the vert beginning stages of a remodel. We are going to start on the bathroom. Im scared because we are going to do it ourselves but you are giving me some motivation thou. 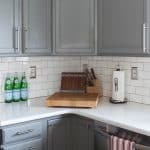 What size subway tiles did you use in your kitchen? Gorgeous! We are in the middle of our kitchen Reno and are considering Wilsonart Quartz. Do you mind if I ask how your Quartz is holding up? Any staining, chipping, etc? Thank you! 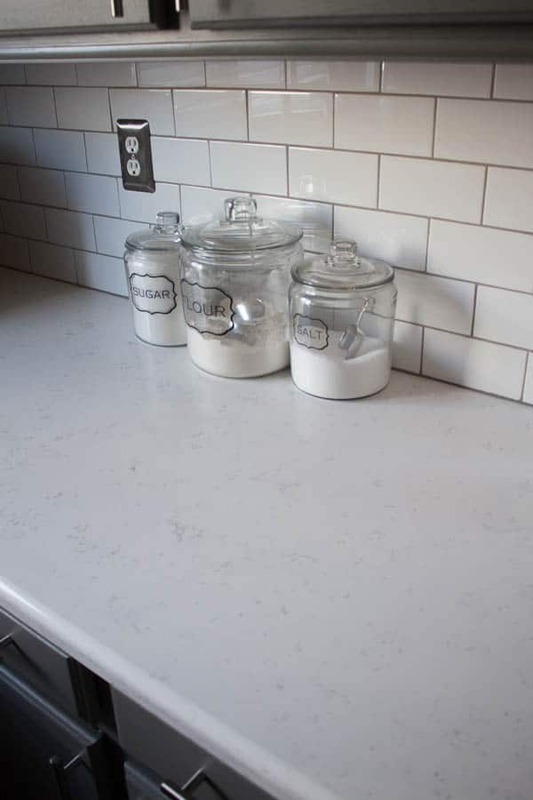 It’s hard to find many comments regarding Wilsonart Quartz! Thanks for your prompt reply! We are definitely leaning toward the quartz. Can’t wait! !